Humidity can affect the tuning and general play-ability of your piano. The most change with tuning will occur in the middle section of the piano close to what piano tuners call the center break. On an over strung piano the bass strings run over the mid and treble strings and at the point this happens this is called the center break. The pitch change mostly happens from the break through to about an octave toward the middle of the piano. Some piano makes are affected more than others and a younger piano will be affected more than an old piano. Generally pianos with a bright active tone and a high dynamic range will be effected more. These changed will happen over a 3 week period. E.g. so if your piano is tuned at the beginning of winter then as winter gets wetter the piano will start to go sharp in the mid-section. However it will go flat in the mid-section if you have drying heating. The ideal humidity safety zone for a piano is between 35% and 55%. Pianos will stay in tune very well in this range. Humidity changes will also affect the Action of the piano. In dry conditions the Action will become loose and sloppy and can even become noisy and notes can stick because the Action parts can rub on each other. You must remember that these are not a problem in a piano if you understand your piano and when you tune it. If you tune your piano in the middle of summer or winter in the opposite season your piano will sound gosh awful. If you wait till the same time you tuned the piano it will sound great again but will still need a clean-up tuning. I often have to pitch down the mid-section of a piano in winter before tuning it. In Summer I have to pitch raise the mid-section before tuning the piano. Remember that if your piano sits between 35% and 50% you may not have the above problems. So what do we do to stabilize your piano? Yes you can buy a Digital piano. No Tuning, No pitch problems, No Tone, No value when you want to sell it. No brainer. Ask your piano tuner to fit a Piano Life Saver System made by Damppchasser in America. They are available all over the world. They have a humidistat (A measuring device that measurers the humidity in the piano). Then when the humidity is low it turns on a humidifier to raise the humidity. It continues to cycle. Keeping your piano sounding nice all year round. There are a few things to be aware of with humidity control. Firstly if you have an older piano make sure your tuner is fitting a humidifier that has a higher humidity level. They are available and Damppchasser do a special run for me. Your tuner just needs to ask his supplier. 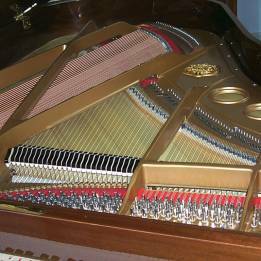 (The tuning pins can go loose with older pianos if they have been in a high humidity area. This makes the piano lose tune). When to tune your piano. If I see a piano that is sharp in winter or flat in the mid-section I immediately ask the question. When was the piano last tuned and in what month. Summer or winter and has the piano been moved in that time from a dry environment to a moist environment. Then I can assess if the piano needs humidity control. Also if the piano needs humidity control it’s important to fit the humidity control then tune the piano 3 to 4 week later. Often the piano will correct itself within a week or even days. If your piano does not drift much then its best to have it tuned between seasons. Why does a piano go out of tune with humidity changes? The soundboard is the amplifier of the piano and is huge. It is the width of the piano and as high as the top of the action. The strings of the piano are connected to the soundboard with a bridge just like a Violin with the strings going over the bridge where the bow runs across. And like the violin the strings are pressed against the soundboard. In a piano the strings are long in the bass and short in the treble. So the bridge runs across the middle of the soundboard and that is where there is the most movement in the soundboard. The Bass strings sit on the bridge at the bottom of the soundboard so there is not much movement there. The treble strings at C8 are only about 50mm long so there is not much movement there. The center strings start on an open part of the board so with the pressure on the board from the triple string notes the movement is greater at the start of this section.